Throughout my life, I have always been on the lookout for nuggets of wisdom that would occasionally drop from the lips of great players. Unfortunately, I realized early on that most of the time, the nugget was all you got! There would usually be no explanation or elaboration of the meaning of the statement. Such statements tended to be obscure, and although I knew there was great meaning in them, the meaning was inaccessible. One of the most inscrutable statements was the admonition to “play from the string”. I would run across this statement in different places, as various master players would use it in discussions of the way they approached playing the guitar, and wonder what it meant. It seemed to have something to do with the idea of “touching” the string before playing it. Okay, I can try working with that, but how is that possible if you are playing at super fast speeds? Are you telling me that a good player takes the time to touch the string and then play it-even if they are playing really fast? How is that possible? There doesn’t seem to be time for that. That was where my understanding began to break down. Well, there’s nothing like decades of playing and teaching to help fill in the gaps in one’s understanding! I think I have a pretty good grasp of this now, and I will share it with you. I was in a lesson a while ago that brought this subject to the forefront. The student had brought her scales (on electric with a pick) up to around 80 bmp in 16th notes. She had started from a basic inability to play scales smoothly and reliably at any speed, due to the usual fundamental flaws in technique and overall practice approach. But now, as we were hitting a wall at around 80bpm, it was starting to break down. It was interesting because there were no visible signs of things being done wrong. The pick work was good, the left hand form and movement, which we had been working on for awhile, was also good-there was nothing obvious and visible to focus on as the source of the problem. Most students in this difficult position would be told to “practice more”. Indeed, it seemed like the kind of thing that “just needs more work”. In my opinion and experience, that may or may not be true. This student, and others in her position, may, after months of dogged practice, begin to melt that obstruction and find their speed going up. But it is probably more likely that they would not. I have seen players who are stuck for years in this spot, and cannot seem to make that scale speed budge. This is because the nature of the problem is very, very subtle. It cannot be seen, it must be sensed by the teacher, and the teacher must guide the student to inwardly “feel” it. And, it has everything to do with playing from the string. As I watched my student’s right arm while she played, I was aware that there was a “tightness” to it, even though her form was good. Yes, the hand itself did not look tense, and the pick was staying close to the strings, but still there was a subtle tension present that seemed to be going throughout the arm, and into the shoulder and beyond, during the playing. Although she started very relaxed, this tension was there after the first note was struck, and not only remained, but got worse as the 2 octave scale progressed. The faster the speed, of course, the worse it got. So, I began to explain a bit about some of the subtle dynamics of the physical act of touching a string with the pick, applying force, and repeating that process. The first fact to appreciate is that as soon as we play a note, the hand, wrist, arm, and shoulder region tense up. They must tense up to a degree, in reaction to the force the string applies back to the pick. Most players tense too much during this reaction and most importantly, do not release the tension reaction before the next note is played. 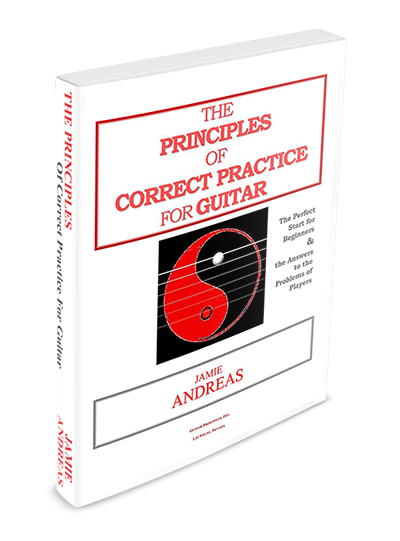 This single dynamic, by itself, is responsible for preventing a great number of players from advancing to their next level, and also prevents a great many beginners from being successful in their efforts to learn guitar, causing them to give up. So, if we keep tension in the arm between the notes, while the arm/hand are moving to the next note, what do we have? We have a tense arm swinging through the air, like a plank of wood batting at the strings! Can you appreciate how destructive that is of the act of smooth playing? Can you imagine performing other physical actions requiring great coordination and control – especially actions where the body must come into forcible contact with an object – and keeping the body tense throughout the action? Can you imagine running while keeping the legs tense? Or boxing and throwing punches with a tense arm? How about falling and tensing the body as you hit the ground? Ouch! Crack! Now, most students are suffering from some degree of this situation, and this student has attained a relatively high degree of smooth functioning already, especially compared to where we started. But, these are the kind of things that come up for all of us when we hit what for us is our current playing limit, and when we do hit our limit, subtleties such as this is one of the primary places we want to look. I realized that I needed to deepen my students understandings of these dynamics in a way that would translate into real results and real progress. First, some imagery and metaphors. One of the best ways of becoming sensitive to the realities of playing with a pick (or fingers) upon a string is to think of a tightrope walker. Imagine yourself on a highwire, 100 feet up in the air. Where we are on the highwire is our first concern. Think of how different it would feel to have to step on to the wire at one end, with one foot, as opposed to being on the middle of the string. This is how different it is, from the perspective of the hand and arm, to play near the bridge with its much higher tension, or to play at the middle of the string. For our highwire analogy, let’s assume we are lucky enough to start with both feet placed on the wire, near the middle. Let’s imagine we are balanced with both feet on the wire, and are going to take a step over to one side, and commence walking along the wire. As soon as we lift a foot in the air, everything changes! All of our weight goes on to one foot, and our center of gravity is drastically different, requiring an immediate re-adjustment of all our muscles as they seamlessly adapt to the new situation, this new set of dynamics. People who can do this with some facility are said to have a good “sense of balance”, and while that is true, they are obviously doing a few things, and not doing some other things. Imagine if, as we lifted one foot and thereby created this different set of dynamics, we kept all of our muscles tense, so that when the need for an entirely new set of dynamics instantly appears with the lifting of the foot, we are unable to make that adjustment because all our muscles are tensed. This tension kept in the muscles would compel our body to meet the new set of dynamics caused by lifting our foot with the same adjustment with which we met the entirely different dynamics of being on two feet. We would be in trouble. We would be in for a fall. Get the knowledge & training that will get YOU "playing from the string"! 2nd: Study "The Yoga of Guitar"
Learn the deepest secrets of great guitar playing. These 2 works will reveal a new level of understanding guitar technique that will revolutionize your playing. Well, obviously as soon as we begin to lessen pressure with our foot, we should be in intimate contact with the string, its changing state of tension, and how that feels to our body. If we have a sense of balance, that means that our marvelous computer brain is able to calculate all the intricate muscle adjustments we must make in order to keep our body upright on the wire. When we are playing skillfully, we are also doing something else. We are also talking to the strings, and telling them what we want. Every time we touch the string with finger or pick, we are talking to the string, and telling it what we want. The string then talks back to us, and tells us what we must do to get what we want. When this conversation is taking place intensely and unhindered, so that there is an intimate communion between finger and string, and a feeling of oneness between ourselves and the guitar, we are playing from the string. The situation is this: the arm, and indeed the musculature of the entire upper body, is entirely habituated to this level of chronic tension while playing. The player cannot become directly aware of this excessive tension, it feels normal and necessary. We need a process of intervention. Here is how I began to intervene in this process with my student, and began to coax the muscles to a new experience and a new functioning. First, I had her do an awareness exercise with the pick. We called it “Hello, Goodbye”. Following a principle I often employ in pedagogical diagnoses, I removed one of the dynamics from the playing process, in this case, the dynamic of applying pressure to the string. I began by removing this dynamic because it is this dynamic that causes the tension reaction in the arm. I had her simply bring the pick to the string, slowly and lightly, and merely touch the string, apply no pressure, and take the pick quickly away. I had her play the whole scale slowly like this, with no pressure and no sound. Very simple, and very effective in teaching the arm to perform the action of bringing the pick to the string and not going into the automatic tension reaction it had become habituated to. Second, we performed the same action, except this time we brought the pick to the string, and then applied a very small amount of pressure with the pick, paying attention to the small rise of tension in the arm that must accompany this action, and then removing the pick, paying attention to, and enforcing the release of that previous small rise in tension. (Principled Players will recognize this as a version of the gradual pressure technique, a practice tool used frequently throughout the Foundation Exercises from “The Principles”). The mind must do its part here, it must be investing these movements with conscious awareness, or there is no benefit. The physical actions are merely providing the mind with the opportunity to perform its necessary function in the practice process, to “infuse conscious awareness into the body through the mechanism of attention”. Finally, we brought the pick to the string, applied a small amount of pressure to the string, and instead of taking the pick away and relaxing, we pushed through, and “relaxed through” the string. When doing this, we think of, feel, and re-create the same feeling of relaxation in the hand and arm that we had when we merely took the pick away from the string without playing. This is the essential procedure for undoing the condition we have been examining, and for beginning to learn how to “play from the string”. Using this procedure, we simply work with it daily, using the Basic Practice Approach (Chapter 5 in “The Principles Of Correct Practice”, the summary approach of all the Principles as applied to a working practice procedure). By doing this exercise, we are disrupting the habitual action of the arm as it goes to the string, which is the action of bringing an already tense arm to the string, and smashing at the string with this unresponsive arm, instead of bringing an arm to the string that is able to interact with the string upon contact. These exercises must be done daily, with great focus, over an extended period of time. It will take weeks to months to undo the previous habits and functioning of the arm and hands. However, an entirely new level of playing will now be possible for the student who wants this higher level of playing ability enough to pay this price. Over time, the entire feeling of playing will change as the arm and indeed the entire upper body learns to react in a completely new way to the experience of interacting with the string. When I was in the early stages of this conversion process myself, I began to notice an entirely new sensation in playing. It was this: the strings began to feel like rubber bands! Yes, they began to have an entirely elastic quality to my touch, as my touch became refined. I called it “the rubber effect”, and began to look for it and explore it. At the time, I did not understand what was happening and had no knowledge of all the theoretical background I have given you here, I just knew that all of a sudden, playing the guitar was beginning to feel radically different. I discovered the sensation first by following my intuitions in practice, discovering these sensations, observing them and finally, analyzing them. In comparing these sensations to the sensations they were replacing, I realized that this “elastic” quality was so noticeable because it was replacing a very “hard” unyielding, and inelastic sensation that my hands and body had previously experienced while playing. Of course, I did not think of it as a “hard” sensation because I had nothing to compare it to, it was simply “normal”, and this is precisely the fate of so many players- playing feels “hard” to them, it is often uncomfortable, and they think that this is just the way it is, and good players are somehow dealing with it. No, they are not; good players are having a different experience altogether. The important thing to realize is that the sensation of the strings as “hard” or as “rubbery” is not actually a reflection of the state of the strings; it is a reflection of the state of our body as we play. As we do with every self-generated reality, we project it outward, and believe that it is “the way things are”. This is a great deception and a great illusion. The “hardness” of the strings prior to my discovery was the result of the fact that my relatively hard musculature was coming into contact with the strings with every note I played. I was experiencing my own state, not the state of the strings. When I changed the state of my body as I played by changing the way I was interacting with the strings, I experienced that was a change in the feeling of the strings. Well, there you have it, one of the most important and subtle insights you can have into the process of playing the guitar. Take a while to wrap your brain around it. These kind of things usually take months to years to fully germinate and bear fruit, so think about it, re-read this many times, make your own observations and draw your own conclusions as you practice and play (from the string, of course! ).